For works with similar titles, see Inferno. Inferno is the first part of Dante's Divine Comedy. See also the list of English translations of Dante's Divine Comedy on the English Wikipedia. 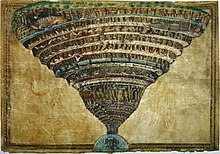 Boticelli's chart of Dante's Hell.